As a child, I was entranced by this fairy tale, the notion that a true princess would be so sensitive as to detect a tiny pea placed beneath twenty mattresses and twenty down quilts. I once placed a pea beneath my own pillow to test the theory, and the restless night that ensued confirmed my long-held suspicion that I, too, was of royal descent, and had somehow wandered away from the palace to find myself living in the wilderness with wolves. These things happen. At any rate, I visited Soulemama's blog the other day, and to my delight saw her interpretation of the story as a play-acting ensemble for her daughter. Brilliant. And when I showed it to Caroline, she wanted it. All of it. My initial plan was to sew a few mattresses together and cut out a paper doll. But Caroline saw that Adelaide had a special bag for the occasion. And she wanted that bag. So I tried not to panic. Tried to ignore those voices in my head telling me I can't sew. I sat down and thought about that bag, tried to become one with it, until finally it revealed itself unto me. And I just want to make a comment about the step shown above: when sewing a bag with lining (if you have the audacity to do so), place the outer bag inside out inside the lining, which must be right side out. Pin the strap between the two fabrics. Sew around the top perimeter, turn the entire thing inside out, and fall off your chair in disbelief: behold, the bag! It's aliiive! I am not including this description to gloat, by the way, but merely to prevent my brain from exploding the next time I attempt another bag and reach this impasse. Trust me, I've never had to think so hard in my life. Let's just take one more look at that bag, shall we? Caroline has been delighted with the results. She decided upon a pea from her collection of beads and added a queen to the cast (painted by Sophie), though she has not yet requested a prince. He doesn't seem to be necessary in the version she is currently playing. She does, however, want a ladder like the one Adelaide's brothers made for her. It's pretty much at the top of my list of things to do (she keeps asking), and I'm sure she will think of new things to add as she goes. This is definitely a game-in-progress, which is one of my favorite ways to play. 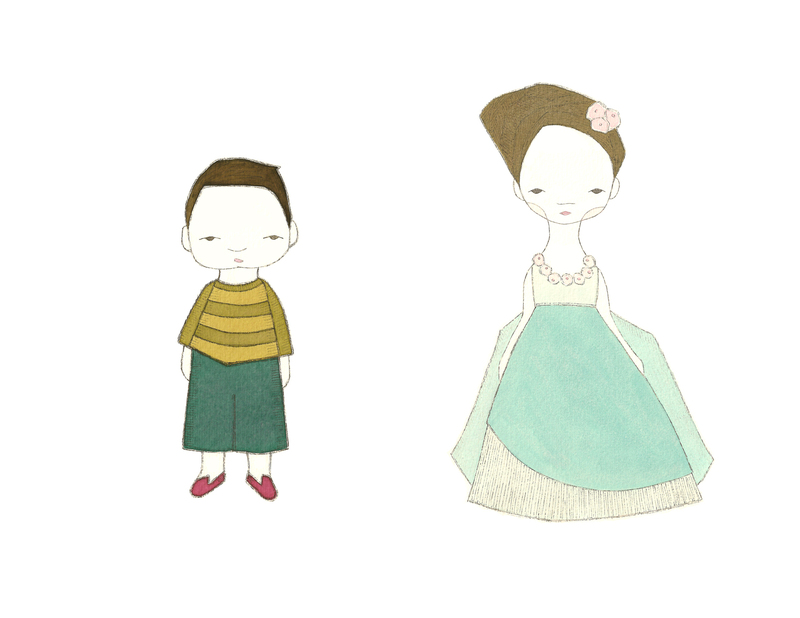 Would you like to make one of these little fairy tale ensembles? Because you are welcome to use some Tollipop paper dolls for this very purpose...I think Edwin and Celeste would make a smashing couple. Dear me, but he looks like the type who might let his mother have the final say! p.s. if the images are gigantic when you open this link, you can right click and save it to your desktop...then it should print out properly on an 8.5 x 11 piece of paper. Can you feel it? As a girl, Valentine's Day was practically my favorite day of the year. I just thrilled over the possibilities of a day dedicated to love: secret admirers, handmade notes, gallant gestures, direct eye contact, flowery sentiments, confessions of amour, anonymous nosegays, boxes of chocolates...all things exquisite and deeply felt. Oh, the rapture! Oh, the joy! Of course these thrills existed almost strictly in my imagination, but that made them none the less stirring. Today, in my busy life, I still have a secret affinity for the magic of Valentine's Day. I believe in it. It doesn't necessarily have to be on the level of a wet and panting Mr. Darcy crossing the moor in a thunderstorm to say he loves you body and soul...though who am I to quibble with such ardor?! I just believe in love, in all its forms. And I think it's wonderful to let loved ones know how you feel. Simply. Every day. But especially on this day. With that in mind, I am offering some sweet and silly valentines for you to send out into the world. If you can find a moment, purchase some red cardstock and glitter and have fun adding your personal touch to these pretty notes. Love is in the air, dear reader. Adoration, fondness, affection, romance, devotion, passion, fancy...I can feel it and hope you do, too! When I was a child, my mother never made me write thank you notes. But then I grew up in the Canadian wilderness and ran with wolves, dear reader. You can hardly expect to call upon the same exemption! With that in mind, it is time to sharpen your quills and begin composing prose of the most flowery, appreciative sort! And it will be such fun with these little Tollipop thank you notes! You'll simply be astonished at the pretty manners which flow from your pen! And when Mr. Darcy thunders by on his panting steed and requests shelter for the night, won't he be impressed by your little stack of epistles and won't he think to himself, "Elizabeth who? !," once he looks into your eyes and realizes there is no more fair nor literate damsel in all the world than the one who stands before him at this very moment?! Heaven and earth, dear reader, what are you waiting for? Go and fetch the India ink, and be quick about it! Happy Monday, everyone! I hope you had a nice weekend. It was lovely chez Tollipop, owing to a delightful moment of family togetherness at our favorite Thai restaurant wherein I practically bathed myself in green curry, a Saturday morning at the park with the girls, much listening to Christmas carols and practising a few of our own, and the promise that snow, yes snow, is coming to Las Vegas! Just because I choose to dwell on the prettier moments doesn't mean we don't have our mutinies, our coup d'états, our dreaded piles of laundry! At any rate, I wanted to offer something pretty to you, dear reader. This is not an original idea by any means, but I made a few Tollipop gift tags for you to download and use at your leisure. A carefully wrapped package has always been a source of delight to me, and although I feel somewhat pressed for time these days, I hope to spend a few relaxing moments before the 25th surrounded by paper and string. p.s. the Tollipop ornament giveaway is still in full swing! To enter, simply leave a comment on the December 11th post.